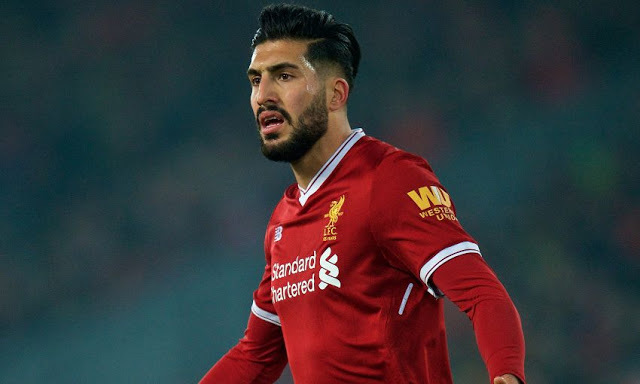 Juventus are reportedly set to offer Liverpool midfielder Emre Can a deal expected to be in the region of £4.5 million per-year in a bid to lure away the German to the Serie A giants next summer. The German international has refused to extend his contract with the Reds after negotiations is believed to have reach an impasse since last month and could be set to leave Anfield on a free next summer with his contract set to expire at the end of the season. According to the Dailymail, the German midfielder is a priority signing for Serie A giants with Massimiliano Allegri a huge admirer of his skill set and would like to bolster his midfielder option with the services of the enforcer. Reports suggests the central midfielder has verbally agreed a deal with the Turin club ahead of a move to the Allianz Stadium in the summer. It is believed the £4.5 million a-year offer from the Old Lady will make Emre Can one of the highest paid players at the Allianz Stadium with only the likes of Miralem Pjanic, Paulo Dybala, and Gonzalo Higuain to earn more than the German. He is being earmarked as a long-term replacement for the aging and injury prone Sami Khedira and will likely get more regular playing time with Allegri seeing him as a key part of his midfield next season. The 23-year- old has impressed in the middle of the park for the Reds so far this season and has made a total of 13 appearances for Liverpool in the Premier League this term. Emre Can is often deployed as a defensive midfielder but he can also play as a centre back or a full-back. The former Bayer Leverkusen midfielder is known for his passing, tough tackling, breaking down opposition play, concentration, long shots and defensive contributions.